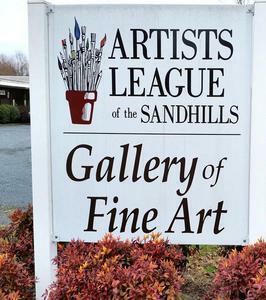 © 2018 Artists League of the Sandhills. All rights reserved. In the early 1990-'s, a group of artists worked diligently to create a place and environment where they and others could pursue their artistic goals and realize their dreams of a community of artists. Classes and workshops are open to all and are regularly listed in local publications. Chuck Lunney and Mike D'Andrea led the way. The city of Aberdeen generously provided the place, an old railroad storage terminal, and the work of many artists and local business persons created and shaped the atmosphere. The Artists League developed deep roots, grew vigorously, and is now composed of over 200 members who are housed in the "terminal" that now contains studio space for artists, two large classrooms, two galleries, and a library. The League is now self-sustaining, relying on membership dues, class and workshop income, and donations. The League has a nine member Board of Directors, who are selected by the membership. Board members each serve three year terms on a stagered basis. Their active leadership inspires the participation of the members in the daily operations of the League.